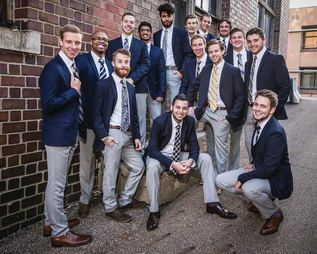 Nuance is The University of Akron's premier all-male a cappella group. Since their founding in 2004, Nuance's mission has been to provide high quality a cappella music to a variety of audiences on campus, in the surrounding community, and beyond. Thanks to hardworking members representing many majors and talents, Nuance has become one of the longest standing and most successful student organizations at the university. Nuance has performed for Fox 8 News, First Night Akron, Cleveland Cavaliers games, the LeBron James Family Foundation, and even an international choral competition in Italy. The group's first professionally published full-length album, New Suit, features over a dozen favorite arrangements, 28 past and present members, and mixing by a four-time Emmy award winner. After outgrowing The University of Akron's largest auditorium four semesters in a row, Nuance took their most recent concert off-campus and performed for over 1000 people at the historic Akron Civic Theatre. Founded in 2005, Rhythm and Roos is a co-ed a cappella group based out of Akron, OH. The Roos are comprised of about 22 members who are mostly non-music majors. They sing at various gigs on campus such as sporting events, special events, charity benefits and social gatherings. Along with performing at UA, The Roos love traveling while sharing their music and representing The University of Akron. They have sang in Washington D.C, Chicago, New York, and Pennsylvania. They have been featured on Fox 8 News, The Akron Civic Theatre, Akron Rubber Ducks games, and have worked with The man himself, Deke Sharon. The Roos pride themselves on creating a family atmosphere while making beautiful music together. Kanga Blue is the University of Akron's student-led female a cappella group, sponsored by both the Honors College and the School of Music. The group was started in fall 2010 from of a lack of opportunity for female singers, as nUAnce was an all-male group and Rhythm & Roos (co-ed, sponsored by Honors) could only take so many women each year. Dr. Dale Mugler (Dean of the Honors College at the time) turned to Merissa Coleman (graduate student, MM Choral Conducting) to start a new female a cappella group that would later be called “Kanga-Blue.” The group would practice a few times a month and perform at UA AcapaROOzas each spring semester. In April 2014, this group of women dropped the hyphen, performed their first bi-annual concert, and became recognized as a student organization. Kanga Blue now rehearses three times a week during the school year and strives to build a stronger a cappella community at UA with the help of Rhythm & Roos and nUAnce. Kanga Blue has performed for organizations including the NEO Roller Derby; International Soap Box Derby, Inc.; the American Cancer Society; the Crohn’s and Colitis Foundation of America and various University of Akron organizations.